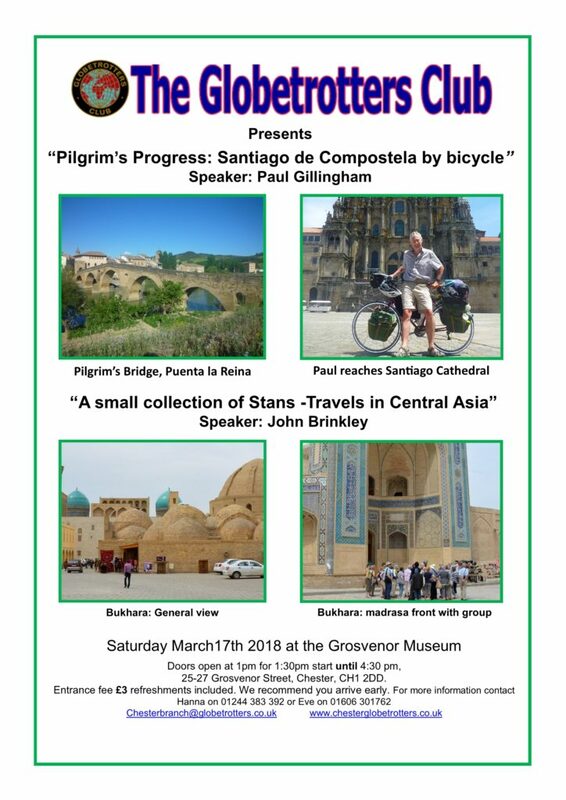 Paul Gillingham – Pilgrims Progress: Santiago de Compostela by bicycle. Now retired, Paul taught History in various countries, then became a radio and TV broadcaster, travelling widely. After serious illness he decided to cycle from UK to Santiago in 2013 as a form of pilgrimage. It was a 6-week, 1600-mile solo ride through France, over the Pyrenees and across northern Spain, camping in France and staying in pilgrim hostels in Spain. His route takes us through changing landscapes and historic towns and villages, with interesting encounters with a range of pilgrims along the Camino (the Way of St James). John Brinkley – A small collections of Stans – Travels in Central Asia. A former geology teacher and now lecturer and photographer.